With 20 days remaining to sign William Nylander to a contract, the Toronto Maple Leafs have asked teams to indicate what players they would offer for Nylander – as well as what teams would not be willing to trade, according to Elliotte Friedman of Hockey Night in Canada. Obviously, the team would prefer to lock Nylander up to either a bridge deal or a long-term deal to get him back within their fold, but this is the first sign that Toronto and general manager Kyle Dubas have reached a point that they have to admit that the team is in trouble and their long-term plan of locking up all their restricted free agents isn’t going as planned. Nylander is rumored to be asking for as much as $8MM per season, while the team is much more interested in signing him to a more reasonable $6MM deal. So far neither side is willing to budge and with time starting to run out (he must be signed by Dec. 1 to be eligible to play this season). If the team truly intends to trade Nylander, they should be able to bring in quite a haul for the 22-year-old goal scorer as he has the potential to be a franchise player for many teams. There have been consistent rumors coming out of both Carolina and Minnesota as Carolina has made it clear they would like a franchise-changing forward and the team has quite a bit of defensive depth, including Justin Faulk as well as younger, cheaper options such as Brett Pesce to include in a package. Minnesota is rumored to have offered defenseman Jared Spurgeon in a package as well. However, with an indication to all teams, the Maple Leafs are willing to make a deal, there could be a much larger contingent of teams willing to make offers to net a player like Nylander. Free agency is now less than a month away from opening up and there are quite a few prominent players set to hit the open market while many teams have key restricted free agents to re-sign. Here is a breakdown of Minnesota’s free agent situation. Key Restricted Free Agents: F Jason Zucker — Zucker has put himself into a great position, posting career numbers in a contract season. Two years ago, Minnesota handed him a two-year prove-it deal, which he certainly has responded to. After the 26-year-old posted 22 goals in 2016-17, he responded with 33 goals this year. In fact, he posted personal bests in games played with 82, goals, assists with 31, points with 64, power play goals with seven and shots with 222. Now a three-time 20 goal scorer and a one-time 30-goal scorer, the team must decide whether it intends to give him a long-term contract, which won’t be that easy considering the team has little room under the cap. His lack of playoff success is also a factor as he’s scored just four goals in 31 career playoff games and just one in the last three years. Regardless, after making $2MM, Zucker should get quite a pay raise. D Mathew Dumba — The Wild also have another key restricted free agent they must lock up as well as Dumba also has stepped up his game in a bigger role this season. While the blueliner averaged 20:20 of ATOI in the 2016-17 season, it increased even more as Dumba averaged 23:49 of ATOI this season. He picked up several personal bests, including games played (82), goals (14), assists (36) points (50) and shots (176). Most importantly, he took on the role as the team’s No. 1 defenseman when filling in for both Ryan Suter and Jared Spurgeon, who both missed time at the end of the season. So now, after finishing up a two-year bridge deal at $2.55MM AAV, he is in line to get a big payday as well from Minnesota. Other RFA’s: F Adam Gilmour, D Dylan Labbe, G Steve Michalek, D Ryan Murphy, D Nick Seeler. Key Unrestricted Free Agents: F Matt Cullen — Fortunately for the Wild, their unrestricted free agent issues aren’t as important than their restricted free agents. The 41-year-old Cullen put up a solid season in his second trip to his hometown state, posting 11 goals and 22 points in a bottom-six role. The real question is whether Cullen even wants to return for another season in the NHL. He has already played in 1,445 career games and has little more he needs to accomplish. He took a long time to decide last year whether he wanted to return as he didn’t sign with Minnesota until August of last year. Now with changes in management, do the Wild even want him back. He wouldn’t be too expensive as it’s likely he would make something around the $1MM offer he made last year. F Daniel Winnik — Another depth option for Minnesota, the Wild must decide if they want to bring Winnik back after a one-year deal at $660K. The 33-year-old veteran played in 81 games for the Wild as a bottom-six wing. While averaging 13:34 of ATOI, he struggled to produce points, putting up just six goals on the season. With little productivity in hits and just a 44.7 percent faceoff percentage with 199 faceoffs taken, he didn’t provide as much as the team had hoped other than veteran and playoff leadership. Other UFA’s: F Patrick Cannone, F Kurtis Gabriel, D Alex Grant, F Zack Mitchell, D Zach Palmquist, F Kyle Rau, D Kyle Quincey. Projected Cap Space: With a lot of heavily-laden contracts on the books as well as re-signing several of their restricted free agents (don’t forget about Seeler either), there is little cap room to work with at the moment. CapFriendly has them with $7.4MM in available cap space. Don’t be shocked, however, that new general manager Paul Fenton makes some trades to shake up the team, which hopefully will free up some of their cap space and give the team an opportunity to compete for more than just making the playoffs in the near future. Although his salary is set to be cut in half for next season and the fact that he recently turned 39, Florida goaltender Roberto Luongo has no intention of retiring, he told reporters, including Jameson Olive of the Panthers’ team website. While the netminder still has four years on his contract left after this one, it’s highly unlikely he plays for all of those considering that the combined salary for those seasons is $7MM; for comparison, he made nearly $27MM the past four years. Not surprisingly, this is a contract that is still subject to salary cap recapture if he happens to retire before his contract finishes. Luongo is coming off an injury-riddled season but played quite well when he was in the lineup, posting a .929 SV%, his best mark since 2003-04. Although he has been cleared to participate in a full practice, it appears that Devils center Marcus Johansson is slated to be a scratch for their playoff opener on Thursday night, reports Abbey Mastracco of The Record. The 27-year-old has been out of the lineup since suffering his second concussion of the season back on January 23rd. While his production had dipped prior to the injury, his return to full health should be a boost for New Jersey as they get set to take on Tampa Bay. 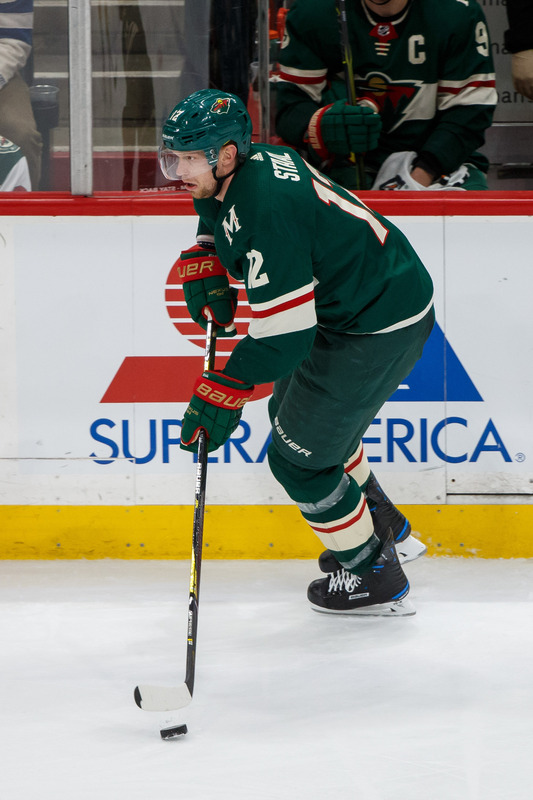 While the Wild will be without blueliner Ryan Suter for their postseason run, they are getting closer to getting a key defender back in the lineup. John Shipley of the Pioneer Press notes that Jared Spurgeon made it through a full practice for the second straight day but head coach Bruce Boudreau is calling him a game-time decision for Wednesday’s game against Winnipeg. Spurgeon tore his hamstring back on March 13th and was initially diagnosed to be out for a minimum of a month so it appears he is right on schedule. If Spurgeon can’t play in Game One, Shipley suggests that Ryan Murphy will make his postseason debut instead. Jeff Blashill will once again be the head coach of Team USA at the upcoming World Championships, with Dan Bylsma, Don Granato and Seth Appert joining him behind the bench. Blashill coached last year’s squad to a fifth-place finish, but he’ll be getting some star power this time around. Patrick Kane has announced that he will suit up for the tournament, and he will serve as captain of Team USA. Alex DeBrincat will also be joining Kane for the US squad, a nice reward after an outstanding rookie season that saw him lead the Blackhawks with 28 goals. The Minnesota Wild have recalled Carson Soucy, and expect him to be in the lineup for Game 1 of their Western Conference playoff series against the Winnipeg Jets. They might get another huge boost on the blue line though, as Jared Spurgeon was back on the ice today at practice. Spurgeon hasn’t yet been cleared to return to game action, but was paired with Soucy at practice and will attempt to get into the lineup for Wednesday’s match. The New York Rangers have signed an affiliation with the Maine Mariners of the ECHL that will start in 2018-19. The Rangers had previously been affiliated with the Greenville Swamp Rabbits, but will now have both of their minor league partners—their AHL affiliate is the Hartford Wolf Pack—located in the northeast. For a team having the success that they have had, the Boston Bruins are also at the top of the Atlantic Division despite suffering through countless injuries throughout the season. While many of those players like David Backes and Patrice Bergeron have done a nice job of working their way back at different points in the season, the injuries continue to pile up. The team lost defenseman Brandon Carlo to injury as he was taken off on a stretcher Saturday with a leg injury and while there is no official word on the specifics or the severity of the injury, NBC’s Joe Haggerty tweets that head coach Bruce Cassidy said it’s probably serious and it is likely that he could miss the playoffs. Add to that, veteran Riley Nash, who took a puck to his head in Saturday’s game. According to Boston Globe’s Fluto Shinzawa, Nash required 40 stitches in and around his ear. On a positive note, the team got back winger Jake Debrusk, who kicked in two goals and an assist Saturday and veteran defenseman Zdeno Chara is playing today. However, the team is still without defenseman Charlie McAvoy, who could return Tuesday, according to Haggerty. StarTribune’s Sarah McLellan writes that Minnesota Wild veteran defenseman Ryan Suter will be out indefinitely after suffering a foot injury during Saturday’s game against Dallas. The 33-year-old went down during the second period when his foot awkwardly collided against the boards after taking a hit from the Stars’ Remi Elie. 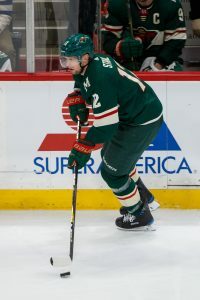 It’s another blow for the Wild, who had previously lost Suter’s partner Jared Spurgeon who went down with a hamstring injury more than two weeks ago. The Wild currently hold the third playoff spot in the Central Division, but need some key wins in the coming days to hold onto that spot. Suter averages 26:46 of ATOI, which is second in the NHL. He has six goals and 51 points, which is tied for his career-high. The New Jersey Devils announced they have activated Marcus Johansson off of injured reserve Sunday. The winger has been out with a concussion since Jan. 23. He is expected to be in the lineup today with Montreal. After acquiring the 27-year-old from Washington in the offseason, Johansson has been plagued by injuries as he’s only appeared in 29 games for the Devils putting up five goals and nine assists this season. NHL.com’s Bryan Burns tweets that veteran winger and penalty killing specialist Ryan Callahan is expected to return today after being out with an upper body injury. The 33-year-old has missed the past five games since being injured on March 22 against Toronto. Callahan has four goals and 15 points in 63 games this season. The Buffalo Sabres announced the defenseman Victor Antipin has been diagnosed with a concussion after taking a hit Saturday from Nashville’s Scott Hartnell. He also suffered facial lacerations, a broken nose and dental injuries. He is out indefinitely.